One, two, free! Buy any 3 Sorbet Skincare Products and get the cheapest one FREE. 14-31 March 2016. 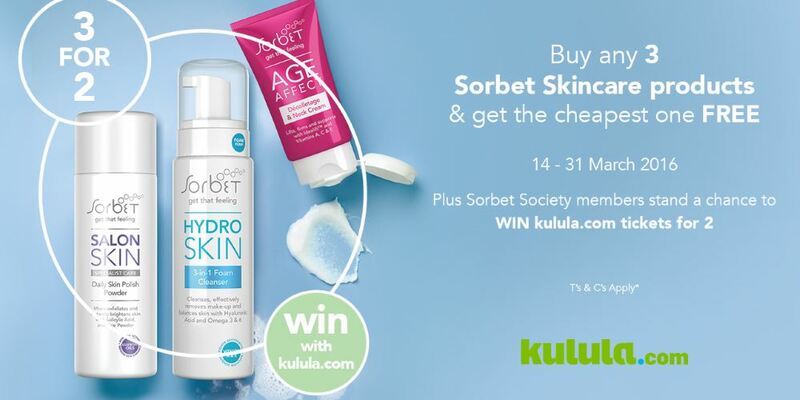 Plus Sorbet Society members stand a chance to WIN kulula.com tickets for 2. This promotion is limited to the Sorbet Skincare range only. In order to qualify for the promotion, 3 Sorbet Skincare Products are required in the sale. Discounted products will not earn loyalty points. The discounts are once- off and cannot be exchanged for cash, credit or Gift vouchers. Promotion valid 14- 31 March 2016. Offer valid at any Sorbet Store nationwide. The Sorbet Experience retains the right to discontinue the promotion at any point in time. Kulula competition is for our loyalty members only. One person stands a chance to win 2 x return tickets on kulula.com to any kulula.com destination within South Africa. Prize winner will be provided with a Freebie Letter, containing a reference code that will be valid for booking 2 return tickets only. Flight bookings made using the Freebie Letter must take place before the expiry date stipulated in the Freebie Letter. The validity period of the Freebie Letter code cannot be extended. The original Freebie Letter is the only form of exchange provided and cannot be replaced nor copied. Please take this original letter with you to the airport and hand it in at the airport upon check in. The kulula.com airport taxes and service fees will be covered by the Freebie code. There are limited seats available on peak period flights, i.e. long weekends, public and school holidays, Fridays and Sundays, so you would need to book in advance. Booking requests should ideally be made a minimum of one week prior to the intended date of travel. Comair does not warrant or guarantee that the flights will be available at the intended time of travel. All flights not utilised by the expiry date of the Freebie Letter will be forfeited and Comair shall have no obligation to refund any monies in lieu of these un-utilised flights. Once the booking is confirmed, the kulula.com General Conditions of Carriage for Passengers and Baggage and/or General Change Policy come into effect, i.e. changes to the time and date of travel need to be done more than 24 hours prior to departure and an administration fee per change per direction will be charged, payable by credit card only. Changes can be done telephonically with us on 0861 KULULA (585852). Changes are subject to availability.